Standing in front of an arch that closely resembles the architecture of the Alhambra in Spain, the Moorish chief exudes power and mystery. This painting was probably shown at the Paris Salon exhibition of 1878 with the title Le Gardien du serail (The Harem Guard). Charlemont was a Viennese artist known primarily for his nudes and portraits. While this subject was unusual for him, it was very popular in Europe at the time. The exotically elusive yet strongly suggestive effect of this picture is demonstrated by the migration of its title. 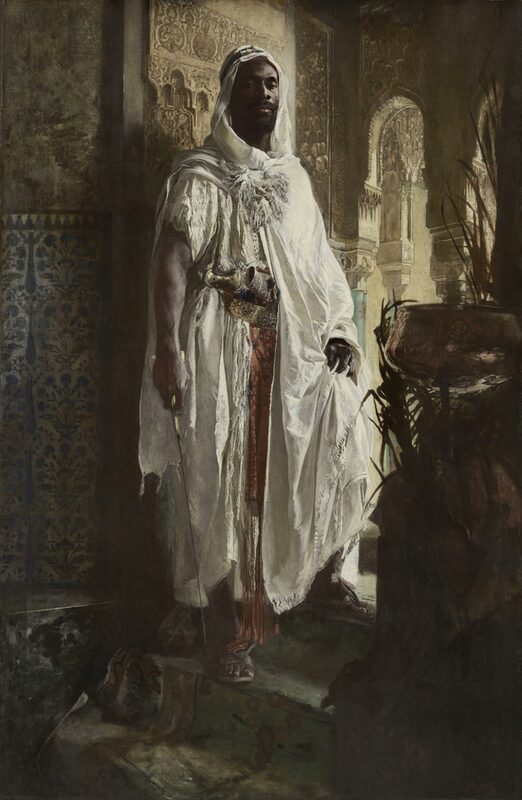 Shown at the Paris Salon in 1878 as The Guardian of the Seraglio, it was purchased by John G. Johnson in 1892 as The Alhambra Guard and published by him in 1914 as The Moorish Chief, the name that has stuck. Thus from its earliest days something about this image of a commanding black man, sword bared, who stands before a space modeled on the Alhambra in Spain, impelled both a clarification of his role and an elevation of his rank. Only part of Eduard Charlemont's career was given over to the popular genre of "Orientalist" painting, which represented subjects drawn from North Africa and the Middle East. Perhaps it was his Austrian background that spawned a kind of overripe hot-house style in his work that saved him from falling into the all-too-conventional drawing-room titillation that plagued Orientalism as a genre. Here his sense of staging is perfect, and his leading man a star. Joseph J. Rishel, from Philadelphia Museum of Art: Handbook of the Collections (1995), p. 198.